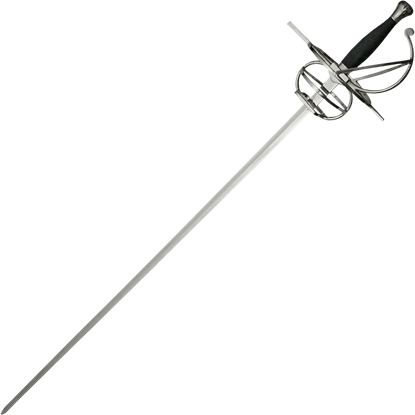 The swept hilt rapier was the civilian weapon of choice for close to 200 years, from the early 16th century to the early 18th. On our replica, nine brass bars, all at least 1/8 inch thick, swirl and curve to make the dazzling cage that protects the hand from being cut. Also, the Swept-Hilt often caught an opponent's blade, opening him up to a fatal stab. Swordplay with the swept hilt rapier was considered an essential part of a gentleman's education and was often used in resolving gentlemanly disagreements. 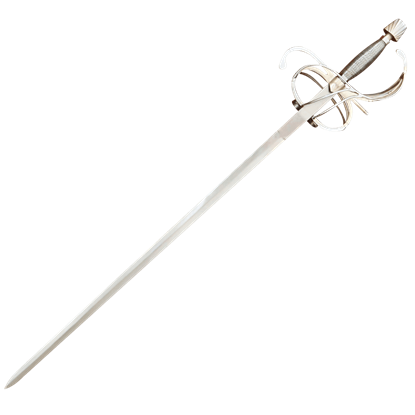 Functional fencing rapier blades typically originated in Toledo or Solingen and would be hilted by regional smiths, resulting in many hilt styles. Hilt finishes were both practical and decorative and gilding, silvering and bluing were all widely accepted methods of providing both decoration and resistance to rust. A duelist needs a sword that excels at both offense and defense. 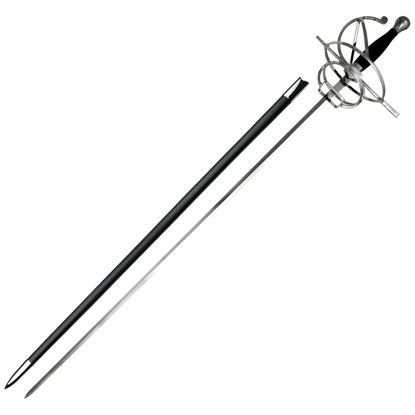 This Blackened Swept Hilt Rapier, with its cut-and-thrust style blade, looks to be just that, while its blackened hilt confers a dark appeal to the look of this blade. 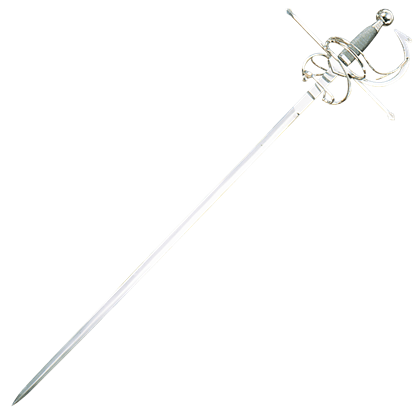 The swept hilt rapier was quite popular in the late 16th and early 17th centuries. This Bone Grip Swept Hilt Rapier is hand forged and has a blade of high carbon steel. The diamond cross section provides firmness and flexibility. The rapier is a classic evolution of the sword, changing as warriors began to favor finesse and skill over strength. 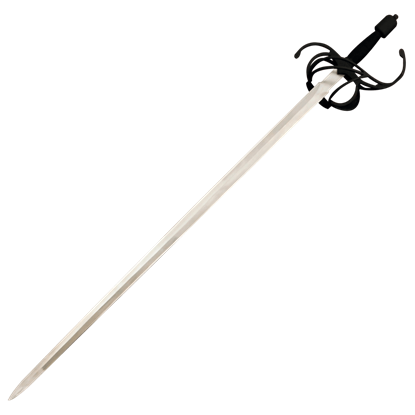 This Brandenburg Rapier is equal parts form and function, possessing a dashing look and a blade fit for any swordsman. 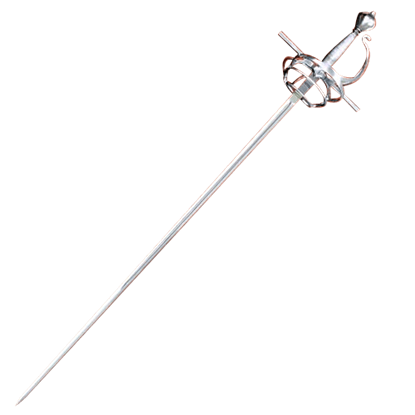 A rapier of identical form and proportions to the Christus Imperat Rapier is housed in The Royal Armouries, formerly known as the Tower of London. The flamboyantly formed hilt is both beautiful and functional. For the most part, swordplay was solely the province of warriors in history. 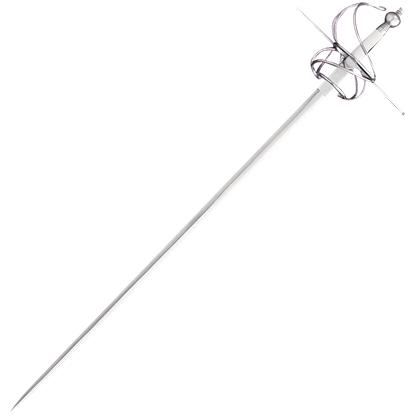 At least, that remained true until the 16th century, when swordplay became popular with civilians and swords like this Classical Swept Hilt Rapier became common. With its graceful, artistic lines, the rapier has always been a romantic symbol of the Renaissance. 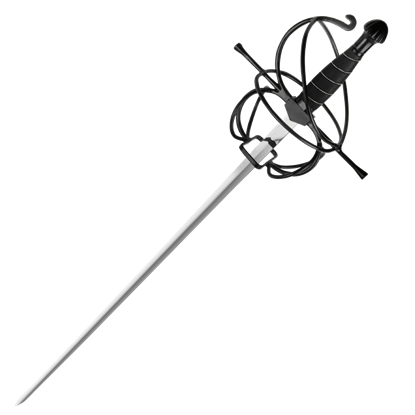 The reality is that the rapier is a deadly hand-to-hand combat weapon, perfectly suited for the swift duelists of the day. 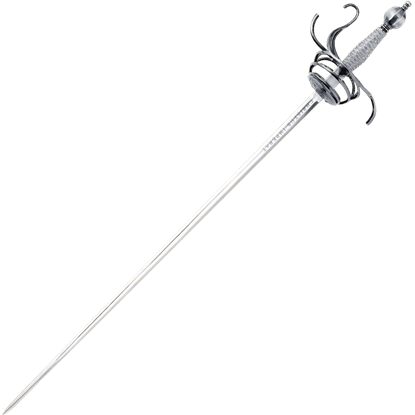 The epitome of skill and noble swordplay was, without a question, embodied in the rapier. 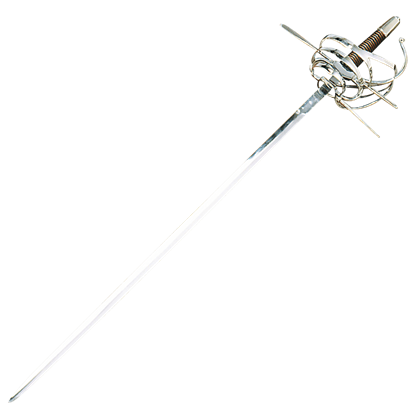 Favored by military and civilians alike, swords like this Duelists Swept Hilt Rapier were a common sight throughout the 16th and 17th centuries. As swords became lighter, carrying and fighting with one became popular among civilians. 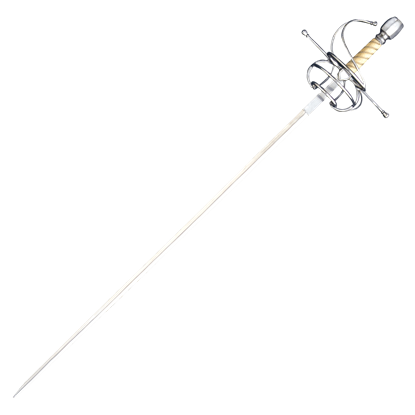 This Fencers Swept Hilt Rapier is one sword that a noble might have carried, as much for self-defense as a symbol of personal skill and prestige.